The final session of the 75th UE National Convention opened with a viewing of the video “Mouseland.” Mouseland is an animated illustration of a 1944 speech by Canadian politician Tommy Douglas, founder of the labor-aligned New Democratic Party and widely considered the father of Canada’s single-payer healthcare system. In it, Douglas tells a fable about a nation of mice who elect alternating governments of cats, until one day a mouse had the dangerous idea that mice should elect mice to office, with clear implications for workers who continue to elect alternating governments of bosses. 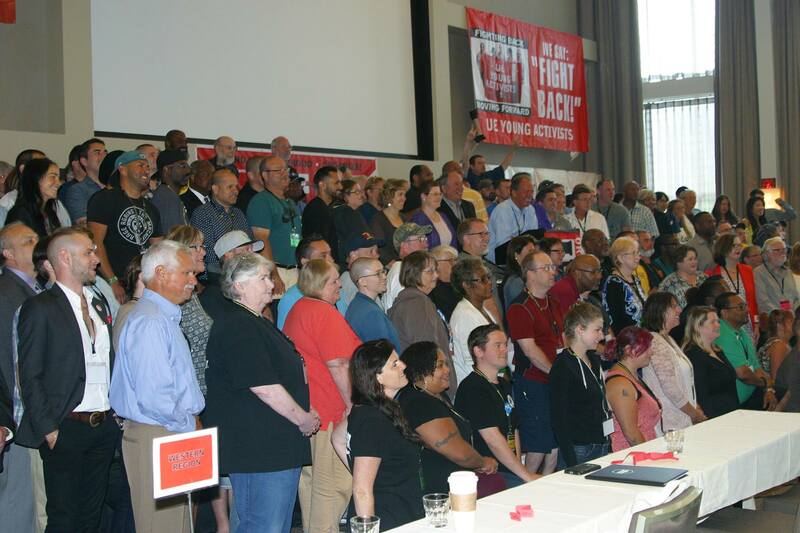 On Wednesday morning, delegates to UE's 75th National Convention discussed resolutions addressing the need to fight for equity for immigrants, women, and people of color, the scourge of workplace closings, and the need for the working class to engage in independent political action. They heard a video address from Senator Bernie Sanders (I-VT), and remarks from Larry Cohen, the board chair of Our Revolution. 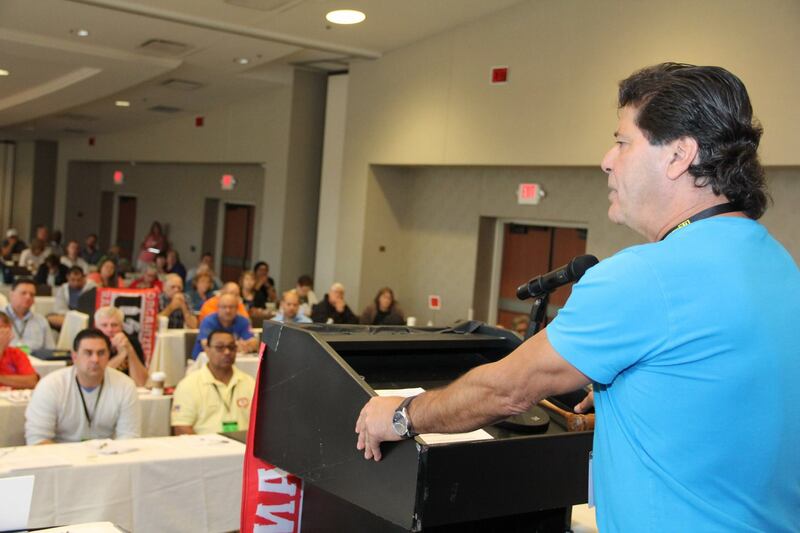 After a day filled with workshops, UE delegates reconvened Tuesday afternoon to discuss the solidarity pact with Unifor. President Peter Knowlton opened the Tuesday morning session of UE’s 75th National Convention by recognizing retiring UE News Editor Al Hart, who has served as Managing Editor of the UE News since 2006. Brother Hart joined the UE as a rank and file member of Local 506 over forty years ago, and later served on UE’s organizing staff. Monday Afternoon Convention Session: Organize, Organize, Organize! 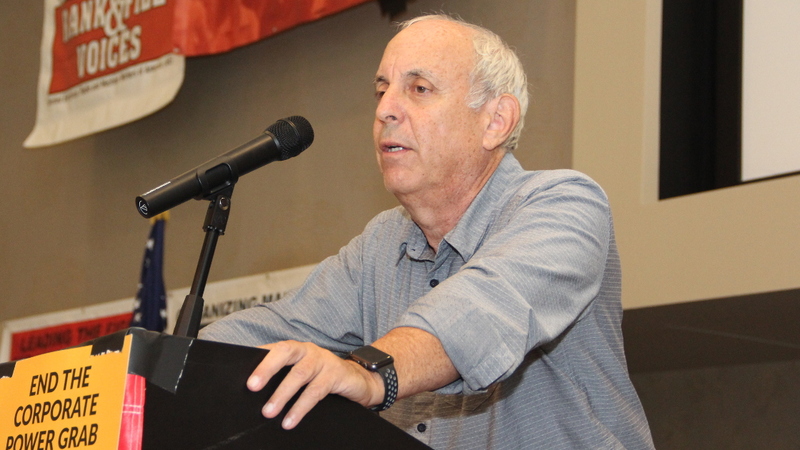 The Monday afternoon session opened with the resolutions “Labor Law Reform” and “Organize the Unorganized: The UE National Organizing Plan.” President Peter Knowlton then recognized Director of Organization Gene Elk, who gave the organizing report. Read more about Monday Afternoon Convention Session: Organize, Organize, Organize! The second session of UE’s 75th convention was held on Monday Morning, August 28th. Delegates discussed resolutions on Workplace Struggle, Restore the Right to Strike, Collective Bargaining, Healthcare for All and Collective Bargaining for Public Employees. They also heard from guest speaker Bonnie Castillo from National Nurses United, who spoke about the importance of a culture of organizing, fighting for social solutions instead of market solutions to social issues, and the struggle for single-payer healthcare for all. UE's three geographic regions - Northeast, Eastern and Western - had their meetings on Saturday in Pittsburgh, to prepare delegates for the national convention that starts tomorrow. 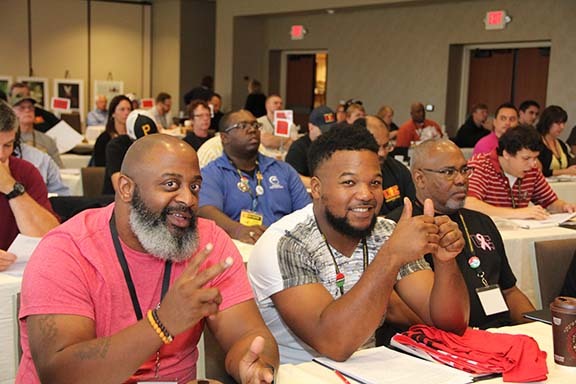 UE's 75th National Convention gets started Sunday morning, but some UE members have been in Pittsburgh since Thursday, getting ready for UE’s most inspirational, educational, democratic rank and file event. UE Young Activists have been hard at work since 5:00 p.m. Thursday, learning about UE and labor history, participating in a workshop on effective strategies for winning fights against management, and assisting with UE organizing.